Most people know they need to create an estate plan but haven't done it because the process is expensive, confusing and time consuming. With Trust & Will, you can complete your Estate Plan in about 15 minutes, on any device, from the comfort of your home. Our simple, step-by-step process walks you through everything you need to do. Once everything is completed, you receive your printed documents in the mail. All you need to do is sign. We provide exceptional customer service and transparency in an industry that's often opaque. Our entire process was designed and vetted by estate planning attorneys with decades of experience. Our products are custom tailored to our users based on their unique life situation, and we cover a wide range of most common scenarios for any adult at any life stage. Documents are securely stored with bank-level encryption. Users can safely access and update their documents from any device. 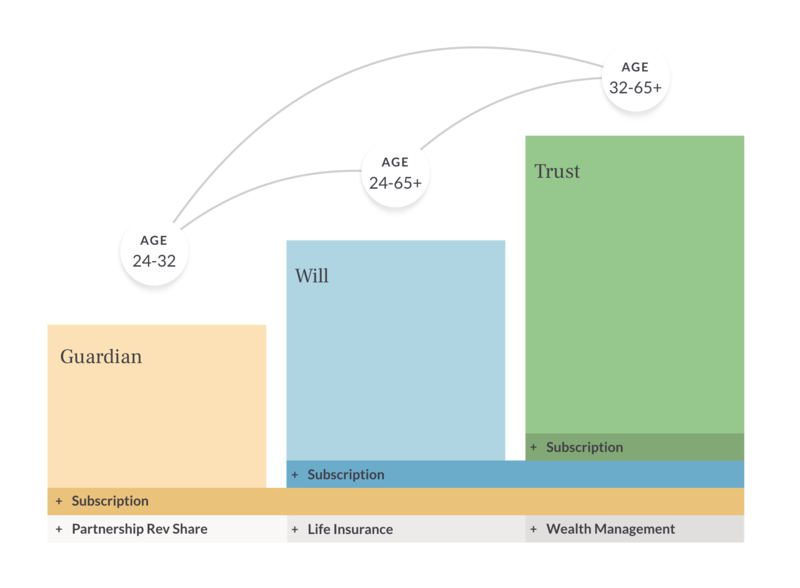 We’re acquiring a new generation of users as they embark on their path to wealth, whether through their own careers, or inheritance. 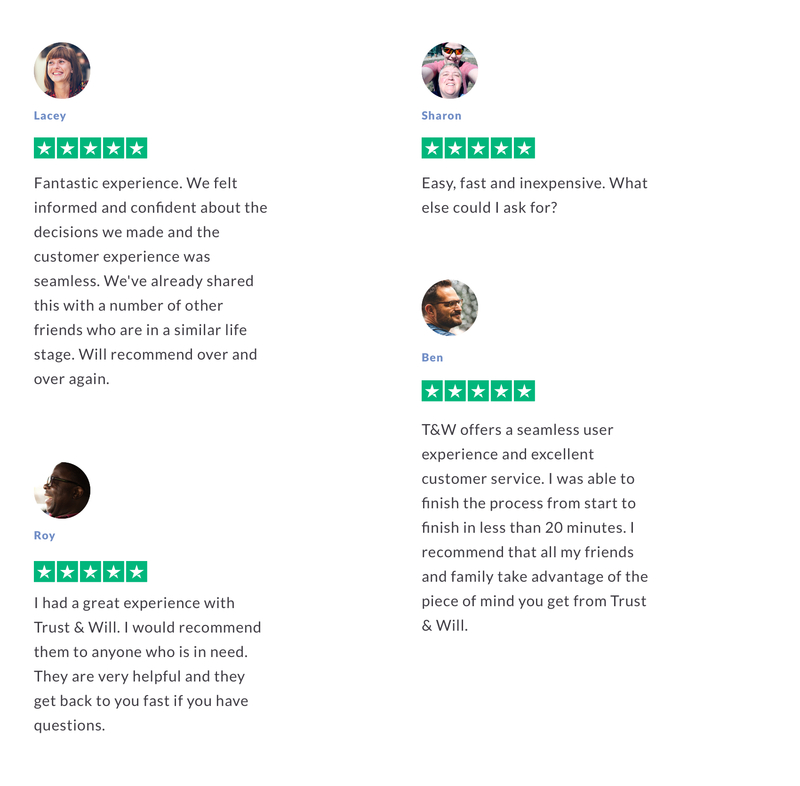 We're proud of our near-perfect rating on Trustpilot. Here's a few highlights, but feel free to browse the full list of reviews here. Our stellar customer support sets us apart. At any point, our members can chat directly with a real live human that is extremely knowledgeable about estate planning and how our product works. We do not provide legal advice but we do help members with understanding their options and making the process as easy as possible. We've created three unique products to accommodate people at any life stage. Each plan is based on customizable common conditions created and verified by a team of attorneys with decades of estate planning experience. Each product includes a combination of a flat fee, subscription, and partner revenues. Estate planning touches insurance, wealth management, real estate, and banking. We have numerous opportunities and channels to integrate and cross-promote complimentary products. Our customers have the ability to opt-in to learn about many different partner opportunities in an authentic and unobtrusive way. Early tests with life insurance providers have been overwhelmingly positive. We are truly grateful that you have taken the time to check out our campaign. We started Trust & Will to help the everyday American take the next steps in protecting their legacy. All three of us have had family members deal with the dark side of estate planning - probate - and the challenges that come along with it. On a personal level, as we navigate our own life journey of marriage, having kids, and buying our first homes as well, we wanted a platform that we would be proud to use ourselves. Most people don’t know this, but we entered San Diego’s biggest pitch competition with an idea (not a company yet), pitched a room full of 500+ people at Qualcomm headquarters, and ended up winning 3rd place, along with a cash prize. We used that money to start the company and begin building our beta release for Trust & Will. Fast forward a year later, and we have achieved so much. We are humbled by the amazing team, customers, and partners we have surrounding us. We can’t wait to bring more new partners (investors) into the Trust & Will family and continue down the path of building the category-leading estate planning company. Cheers to many more good years ahead of us. Wish you could have invested in the early rounds of SoFi or Robinhood? 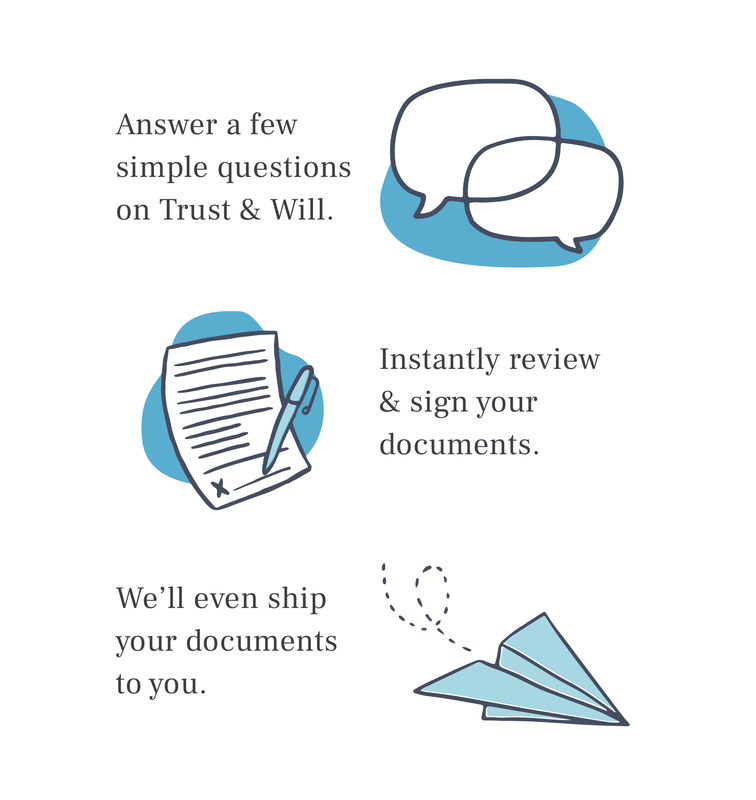 Join Trust & Will and our venture investors to redefine estate planning forever. The smallest investment amount that Trust & Will is accepting. Trust & Will needs to reach their minimum funding goal before the deadline. If they don’t, all investments will be refunded. If a trigger event for Trust & Will occurs, the discount provision gives investors equity shares (or equal value in cash) at a reduced price. Trust & Will needs to raise $25K before the deadline. The maximum amount Trust & Will is willing to raise is $1.07M. Huge Legal Technology Company, Inc.
Tim Draper: Good, I learned something about myself. Okay, so let's bring on the entrepreneur's. 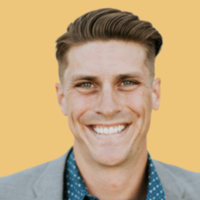 Cody Barbo: My name's Cody Barbo, the founder and CEO of Trust and Will. Dan Goldstein: And I'm Dan Goldstein, also one of the founders. Cody Barbo: Our company, Trust and Will, is building a simple, safe and secure way to setup your estate plan online. Dan Goldstein: We started the company to help families. We've had personal instances where estate planning was challenging and hurtful within our own family structures and so we thought there was a better way to do it. 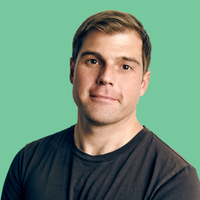 Cody Barbo: So if you've ever heard of a will or if you've heard of a trust, we make it easy and affordable to do it. Dan Goldstein: And we're using technology to do it. Jesse Draper: Well welcome to Meet the Drapers. Cody Barbo: Thanks for having us. Jesse Draper: So give us your pitch. Tim Draper: But first, tell us which ones trust? Cody Barbo: Trust. I'm will. I'm Cody Barbo. Dan Goldstein: And I'm Dan Goldstein. Cody Barbo: If they're found. Tim Draper: Oh if they ... okay. Tim Draper: Well lawyers usually keep those too, right? Cody Barbo: Some good lawyers. Cody Barbo: Yeah, yeah. So when these documents, they end up in the box in the garage collecting dust, they often challenged or lost. And it honestly can tear families apart. Dan Goldstein: And there's usually two deciding incidents for somebody to even setup and estate plant to begin with. Either one, you need to appoint guardians for your minor kids, or the second reason is you have an asset that you need to protect. A home, a business or an inheritance of some sort. And so we've designed a suite of products, from simplest to most complex. All of our products are online. Dan Goldstein: We have a product called guardian for new parents, this three click way in order to elect legal guardians for your kids. We also have the last will and testament, it's the staple of an estate plan. And then we also have trust services. Our business model is pretty direct and pretty easy to understand. Our customers pay us up front, a fee, to set up the documents. And there's a subscription that we're rolling out in the fall as well, in order to store your documents digitally if something were to happen. Cody Barbo: So we move fast. We started the company in October. We launched nation wide in April. We have thousands of clients. We've signed up a nation life insurance partner. A national credit card company. And most importantly is we have a brand that resonates with the consumer. Tim Draper: Are they paying you or is it free for a while and then they pay when they store stuff? Dan Goldstein: So we're adding between 250 and 300 new customers every single week. And then our conversion rate through the funnel, it's about a 15% conversion rate through the funnel to a complete document. Tim Draper: Tell us how you get paid. Where's the money? Dan Goldstein: To see your documents, to download or to order them online, you have to pay and then they receive their documents and then as, right now, the laws are all changing, they're going digital. And so as they go digital, we're allowed to store those documents in the Cloud then and charge a subscription to have them there as well. Tim Draper: This has got to be a subscription business, because you really want people to pay and pay and pay all the way until they die. Cody Barbo: I mean that's honestly why we're here today. We're here raising $2 million with about half of the round soft committed from our existing investors. And really it's because the laws are changing. 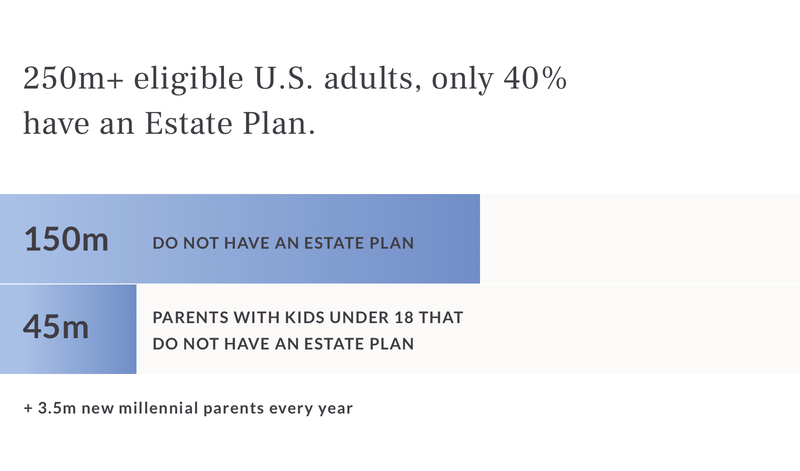 So starting July 1, there was three states that passed law to allow for an all digital estate plan. Tim Draper: Why do you want to do this? Did somebody die? Jesse Draper: That's so morbid. What? Dan Goldstein: We get asked that questions actually. Cody Barbo: It's a reality. No, I'm happy you brought it up. Cody Barbo: It's reality. So for me personally, I've seen the way that this probate court essentially affected my mother in the law and the relationship she has with her siblings. They don't talk to each other than through attorneys. And for me, I have one younger brother, I love him he's one of my best friends, he was best man at my wedding. And I would hate for anything like that to happen. Luckily our parents, their affairs in order, because hey, we started an estate planning business. But it's something that I would never want to have happen, not only to myself and my brother, but to all the families out there that haven't gone through this process. Jesse Draper: And how much does it cost for one of these packages right now? Cody Barbo: For the current will it's $129 for a couple and $69 for an individual. 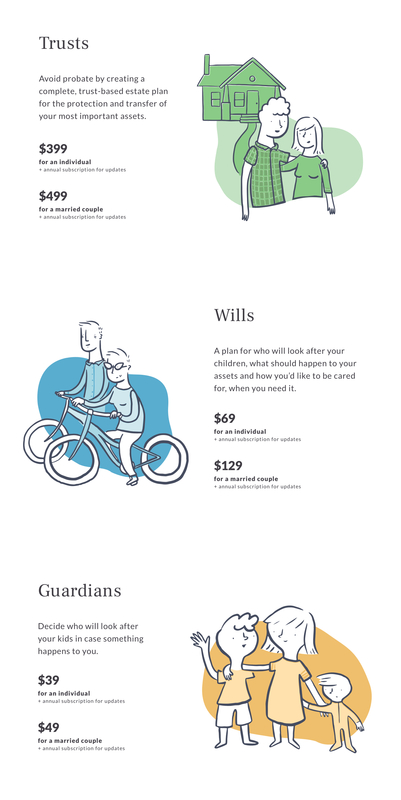 For the guardian product, the introductory price point, $59 to set it up. Siri Srinivas: Is there any friction at all in getting people to use an online platform, where they might have maybe gone to a lawyer? Dan Goldstein: We're targeting young married families. And their situation is rather simpler than a complex estate plan. Siri Srinivas: Are you targeting customers who are already thinking about estate planning? Dan Goldstein: We have chosen the approach from a couple different of our channels to go direct to the consumer. So we go direct to them on social. And what we've realized is that we can acquire customers for a much cheaper price by going direct to them, because it's a back of the mind process. Bill Draper: That's pretty expensive for you to do that. You can't charge as much as it costs to you to go reach them I would think? Bill Draper: Well how does it become ... because the internet? Bill Draper: Don't they want to eventually talk to somebody in person? Jesse Draper: But no, pops, they don't want to talk to somebody. Jesse Draper: It's crazy. Well I have a question, how do you know that someone's not setting up a fake will? Dan Goldstein: It still needs to signed, witnessed and notarized. But they're still required to check identification of the person who's signing it. Tim Draper: Who's the CEO? Cody Barbo: CEO, COO. But we're in this 100%. Tim Draper: And who writes the code? Dan Goldstein: Yeah, so I spent the last six years of my career in custom software development. So as we were starting the company, we recruited developers that I'd worked with and then had a product as well from an agency that I was at prior. Tim Draper: And how do you know each other? Cody Barbo: Yeah, we've been friends for years. In my last company, in the early days when we were at a pitch competition, Daniel was there and he came up to me after we won, which was great. Through that, we became close friends. Tim Draper: By the way, our attorney who does our legal work for the estate, charges $925 an hour. Dan Goldstein: That's a lot of money. Tim Draper: I hope this gets more and more complex so that we can use it. Dan Goldstein: Yeah, and the goal over the next 18 months is, as we roll out additional complex trust services as well. We will be handling revocable living trusts to start, simple trust and they complex trust. And also building out an attorney network as well, so that when people do want to speak to an attorney, we can amortize the cost of those attorney's across all of our users, as opposed to just having a $925 an hour for a phone call. Tim Draper: Terrific. Well thank you so much for coming to Meet the Drapers. Cody Barbo: Yeah, thanks for having us. Dan Goldstein: Thank you guys. Jesse Draper: Thank you guys. Tim Draper: This is great. Cody Barbo: It was fun. It was really cool. I was a little nervous and anxious going in, but when you're around a family it makes you feel like family. Dan Goldstein: They want you to have a good time and Tim makes a lot of dad jokes. Dan Goldstein: The Drapers were funny. They just have a funny little dynamic and you could tell, I come from a family that's similar and it's great. Cody Barbo: If I was to do something differently, I actually would have just preferred a dialogue. They just kind of interjected, but it actually worked out better for us, because the rest of the pitch flowed out much more natural and conversationally. Dan Goldstein: It seems like Jesse understands our business model the best, because we're targeting a target demographic that she fits under as a new parent, or like a newly new ... she's not a new parent. Cody Barbo: We have a mission of helping everyone leave a lasting legacy. Legacy is one of these weird words, that despite what most people think, it's actually defines the property or money you leave behind in your will. If you believe in us, go to our public page and we'll see you on the other side. Jesse Draper: So, what do the judges think? Oh wait, I'm a judge. What do we think guys? Bill Draper: I think it's ... you know, so many things are going online, just one more thing and there is competition, it's very true. But it's quite possible that this could take off. I'm just worried that people who are serious enough about a will would somehow get a lawyer involved. Tim Draper: I think they're going after a great market. I think people are ready for this. I do know an expert system could do just as good a job for me in getting my questions answered as any kind of a lawyer. I do see this all going online. They do have a lot of competition. Jesse Draper: What do you think Siri? Siri Srinivas: I'm thinking perhaps I should write a will. I have never had that thought before, which is interesting because I think they're targeting my demographic. People who are not really thinking about their assets. But I should back up and say we love the legal tech industry. Hundreds of millions of dollars. Most entrepreneur's won't touch it because it's complex and investors won't touch it because it's complex. So I think there's a huge opportunity there. And what about tax, perhaps good for tax planning. They have the opportunity to be doing full estate planning. Tim Draper: They have a great name and brand is really important in this. Jesse Draper: Let's vote. What do you think? Tim Draper: No, we're not going to vote, you've got to go to the crystal ball. Bill Draper: Oh I feel it coming. Tim Draper: We trust in the will of the crystal ball. Okay you got it? Tim Draper: Thumbs all around. Jesse Draper: Thumbs all around. And then whatever you want. Tim Draper: And then you go which way you want to go. Jesse Draper: Do you want up or down? Jesse Draper: Oh wow. You're always trying to be like [inaudible 00:14:44]. Tim Draper: I'm sideways with a little bit ... I'm like at a 60. Bill Draper: You're not very decided. Tim Draper: I'm like 59%. Jesse Draper: He has seen a lot of legal companies. Jesse Draper: But what do you think? Would you invest in Trust and Will because you can. This is the only show on television where you can crowd fund for these companies and you could actually own a piece of the equity. 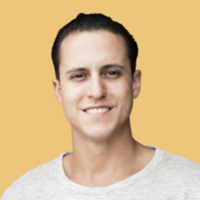 So go to meetthedrapers.com and work with republic to invest $10, $1000, or nothing. Just vote for them and support them. Tim Draper: So let's bring on the next entrepreneur. Our business and services subject us to complex and evolving U.S. laws and regulations regarding the unauthorized practice of law, or UPL, legal document processing and preparation, legal plans, privacy and other matters. These laws and regulations may result in claims, changes to or discontinuance of some of our services, potential liabilities or additional costs that could have a material adverse effect on our business, results of operations, financial condition and future prospects. Our business involves providing services that meet the legal needs of our customers and, as a result, is subject to a variety of complex and evolving U.S. laws and regulations, including the following: Our business model includes the provision of services that represent an alternative to traditional legal services, which subjects us to allegations of UPL. UPL generally refers to an entity or person giving legal advice who is not licensed to practice law. However, laws and regulations defining UPL, and the governing bodies that enforce UPL rules, differ among the various jurisdictions in which we operate. We are unable to acquire a license to practice law in the United States or employ licensed attorneys to provide legal advice to our customers, because we do not meet the regulatory requirement of being exclusively owned by licensed attorneys. We are also subject to laws and regulations that govern business transactions between attorneys and non-attorneys, including those related to the ethics of attorney fee-splitting and the corporate practice of law. Regulation of legal document processing and preparation services varies among the jurisdictions in which we conduct business. Regulation of our legal documents varies considerably among the insurance departments, bar associations and attorneys general of the particular states in which we offer, or plan to offer, our legal documents. In addition, some states may seek to regulate our legal documents as insurance or specialized legal service products. Additionally, we are required to comply with laws and regulations related to privacy and the storing, use, processing, disclosure and protection of personal information and other customer data. Our business operations also subject us to laws and regulations relating to general business practices and the manner in which we offer our services to customers subjects us to various consumer laws and regulations, including false advertising and deceptive trade practices. The scope of these laws and regulations are often vague and broad, and their applications and interpretations are often uncertain and conflicting. Compliance with these disparate laws and regulations requires us to structure our business and services differently in certain jurisdictions. We dedicate significant management time and expense to dealing with these issues and expect that these issues will continue to be a significant focus as we expand into other services and jurisdictions. In addition, any failure or perceived failure by us to comply with applicable laws and regulations may subject us to regulatory inquiries, claims, suits and prosecutions. We expect to incur costs associated with responding to, defending and settling such proceedings, particularly those related to UPL, and the provision of our services more generally. We can give no assurance that we will prevail in such regulatory inquiries, claims, suits and prosecutions on commercially reasonable terms or at all. Responding to, defending and/or settling regulatory inquiries, claims, suits and prosecutions may be time-consuming and divert management and financial resources or have other adverse effects on our business. A negative outcome in any of these proceedings may result in changes to or discontinuance of some of our services, potential liabilities or additional costs that could have a material adverse effect on our business, results of operations, financial condition and future prospects. If we fail to safeguard our customers' information and privacy, our brand and reputation may be harmed, customers may curtail or stop using our services and we may face claims and potential liabilities, which could adversely affect our business, results of operations, financial condition and future prospects. Our online platform involves the receipt, use, storage, processing and transmission of information from and about our customers, some of which may be personal or confidential. We rely on encryption and authentication technology licensed from third parties to secure the storage and transmission of customer information. Sophistication of intrusion techniques used to gain unauthorized access to, or sabotage systems, change frequently and are generally not recognized until launched against a target. We may be unable to anticipate these techniques or implement adequate preventative measures. Third parties may also attempt to fraudulently induce our employees or customers to disclose information in order to gain access to customer information. A third party that is able to circumvent our security measures could misappropriate customer or proprietary information or cause interruptions in our business and operations. Computer malware, viruses, hacking and phishing attacks, and spamming could also harm our business and operations. If an actual or perceived breach of our security measures occurs as a result of third-party action, employee error, malfeasance or otherwise, our brand and reputation may be harmed, customers may curtail or stop using our services and we may face claims and potential liabilities, which could adversely affect our business, results of operations, financial condition and future prospects. We expect to face increasing competition in the online and offline legal services markets from law firms, solo attorneys, online legal document services, national legal documents and other service providers and our failure to effectively compete with these providers may adversely affect our business, results of operations, financial condition and future prospects. We face competition from law firms and solo attorneys, online legal document services, national legal plans and other service providers. The online legal document services market is evolving rapidly and is becoming increasingly competitive. Other companies that focus on the online legal document services market, such as LegalZoom, Willing.com, RocketLawyer and law firms that may elect to pursue the online legal document services market, can and do directly compete with us. Law firms and solo attorneys, who provide in-person consultations and are able to provide direct legal advice that we cannot offer due to laws and regulations regarding UPL, compete with us offline and have and may develop competing online legal services. We also compete with several national legal plans. Many legal plan competitors have focused on employer-sponsored markets or have acquired customers through in-person multi-level marketing. Some legal plan companies may decide to migrate into the direct to-consumer market and offer plans that compete with ours. Our competitors, whether they are online legal document providers, legal plan providers, law firms or solo attorneys, may also be developing innovative and cost-effective services that target our existing and potential customers. We expect to face increasing competition from offline and online legal services providers in our market, and our failure to effectively compete with these providers may adversely affect our business, results of operations and future prospects. We were incorporated under the laws of Delaware on October 26, 2017. Accordingly, we have a limited operating history upon which an evaluation of our prospects and future performance can be made. Our proposed operations are subject to all business risks associated with new enterprises. The likelihood of our creation of a viable business must be considered in light of the problems, expenses, difficulties, complications, and delays frequently encountered in connection with the inception of a business, operation in a competitive industry, and the continued development of advertising, promotions, and a corresponding client base. We anticipate that our operating expenses will increase for the near future. There can be no assurances that we will ever operate profitably. You should consider the Companys business, operations and prospects in light of the risks, expenses and challenges faced as an early-stage company. The development and commercialization of our products and services is highly competitive. We face competition with respect to any products and services that we may seek to develop or commercialize in the future. Our competitors include major companies worldwide. Many of our competitors have significantly greater financial, technical and human resources than we have and superior expertise in research and development and marketing approved products and services and thus may be better equipped than us to develop and commercialize products and services. These competitors also compete with us in recruiting and retaining qualified personnel and acquiring technologies. Smaller or early stage companies may also prove to be significant competitors, particularly through collaborative arrangements with large and established companies. Accordingly, our competitors may commercialize products more rapidly or effectively than we are able to, which would adversely affect our competitive position, the likelihood that our products and services will achieve initial market acceptance and our ability to generate meaningful additional revenues from our products. In particular, the Company is dependent on its Chief Executive Officer, Cody Barbo, and its Chief Operating Officer Daniel Goldstein. The loss of Cody Barbo or Daniel Goldstein or any member of the board of directors or executive officer could harm the Companys business, financial condition, cash flow and results of operations. This means that the Company has ultimate discretion to use the proceeds as it sees fit and has chosen not to set forth any specific uses for you to evaluate. The net proceeds from this Offering will be used for the purposes which our management deems to be in our best interests in order to address changed circumstances or opportunities. As a result of the foregoing, our success will be substantially dependent upon our discretion and judgment with respect to application and allocation of the net proceeds of this Offering. The Company may choose to use the proceeds in a manner that you do not agree with and you will have no recourse. A use of proceeds that does not further the Companys business and goals could harm the Company and its operations and ultimately cause a Purchaser to lose all or a portion of his or her investment. The Company is dependent on Daniel Goldstein and Cody Barbo in order to conduct its operations and execute its business plan, however, the Company has not purchased any insurance policies with respect to those individuals in the event of their death or disability. Therefore, if Daniel Goldstein or Cody Barbo die or become disabled, the Company will not receive any compensation to assist with such persons absence. The loss of such person could negatively affect the Company and its operations. We are subject to income taxes as well as non-income based taxes, such as payroll, sales, use, value-added, net worth, property and goods and services taxes, in both the U.S. and potentially various foreign jurisdictions. Significant judgment is required in determining our provision for income taxes and other tax liabilities. In the ordinary course of our business, there are many transactions and calculations where the ultimate tax determination is uncertain. Although we believe that our tax estimates are reasonable: (i) there is no assurance that the final determination of tax audits or tax disputes will not be different from what is reflected in our income tax provisions, expense amounts for non-income based taxes and accruals and (ii) any material differences could have an adverse effect on our financial position and results of operations in the period or periods for which determination is made. To date the Company has not paid any income taxes. We do not have the internal infrastructure necessary, and are not required, to complete an attestation about our financial controls that would be required under Section 404 of the Sarbanes- Oxley Act of 2002. There can be no assurance that there are no significant deficiencies or material weaknesses in the quality of our financial controls. We expect to incur additional expenses and diversion of managements time if and when it becomes necessary to perform the system and process evaluation, testing and remediation required in order to comply with the management certification and auditor attestation requirements. We may have difficulty raising needed capital in the future as a result of, among other factors, our lack of revenues from sales, as well as the inherent business risks associated with the Company and present and future market conditions. Our business currently has limited sales and future sources of revenue may not be sufficient to meet our future capital requirements. We will require additional funds to execute our business strategy and conduct our operations. If adequate funds are unavailable, we may be required to delay, reduce the scope of or eliminate one or more of our research, development or commercialization programs, product launches or marketing efforts, any of which may materially harm our business, financial condition and results of operations. Various federal and state labor laws govern our relationship with our employees and affect operating costs. These laws include minimum wage requirements, overtime pay, healthcare reform and the implementation of the Patient Protection and Affordable Care Act, unemployment tax rates, workers compensation rates, citizenship requirements and sales taxes. A number of factors could adversely affect our operating results, including additional government-imposed increases in minimum wages, overtime pay, paid leaves of absence and mandated health benefits, mandated training for employees, increased tax reporting and tax payment, changing regulations from the National Labor Relations Board and increased employee litigation including claims relating to the Fair Labor Standards Act. Technology companies, including many of the Companys competitors, frequently enter into litigation based on allegations of patent infringement or other violations of intellectual property rights. In addition, patent holding companies seek to monetize patents they have purchased or otherwise obtained. As the Company grows, the intellectual property rights claims against it will likely increase. The plaintiffs in these actions frequently seek injunctions and substantial damages. Regardless of the scope or validity of such patents or other intellectual property rights, or the merits of any claims by potential or actual litigants, the Company may have to engage in protracted litigation. If the Company is found to infringe one or more patents or other intellectual property rights, regardless of whether it can develop non-infringing technology, it may be required to pay substantial damages or royalties to a third-party, or it may be subject to a temporary or permanent injunction prohibiting the Company from marketing or selling certain products or services. In certain cases, the Company may consider the desirability of entering into licensing agreements, although no assurance can be given that such licenses can be obtained on acceptable terms or that litigation will not occur. These licenses may also significantly increase the Companys operating expenses. Regardless of the merit of particular claims, litigation may be expensive, time-consuming, disruptive to the Companys operations and distracting to management. In recognition of these considerations, the Company may enter into arrangements to settle litigation. If one or more legal matters were resolved, the Companys consolidated financial statements for that reporting period could be materially adversely affected. Further, such an outcome could result in significant compensatory, punitive or trebled monetary damages, disgorgement of revenue or profits, remedial corporate measures or injunctive relief against the Company that could adversely affect its financial condition and results of operations. Our agreements with third parties may include indemnification provisions under which we agree to indemnify them for losses suffered or incurred as a result of claims of intellectual property infringement, damages caused by us to property or persons, or other liabilities relating to or arising from our products, services or other contractual obligations. The term of these indemnity provisions generally survive termination or expiration of the applicable agreement. Large indemnity payments would harm our business, financial condition and results of operations. In addition, any type of intellectual property lawsuit, whether initiated by us or a third party, would likely be time consuming and expensive to resolve and would divert managements time and attention. The current products we sell are commoditized, and we need to rapidly and successfully develop and introduce new products in a competitive, demanding and rapidly changing environment. To succeed in our intensely competitive industry, we must continually improve, refresh and expand our product and service offerings to include newer features, functionality or solutions, and keep pace with price-to-performance gains in the industry. Shortened product life cycles due to customer demands and competitive pressures impact the pace at which we must introduce and implement new technology. This requires a high level of innovation by both our software developers and the suppliers of the third-party software components. In addition, bringing new solutions to the market entails a costly and lengthy process, and requires us to accurately anticipate customer needs and technology trends. We must continue to respond to market demands, develop leading technologies and maintain competitiveness in online estate planning, or our business operations may be adversely affected. Like others in our industry, we continue to face advanced and persistent attacks on our information infrastructure where we manage and store various proprietary information and sensitive/confidential data relating to our operations. These attacks may include sophisticated malware (viruses, worms, and other malicious software programs) and phishing emails that attack our products or otherwise exploit any security vulnerabilities. These intrusions sometimes may be zero-day malware that are difficult to identify because they are not included in the signature set of commercially available antivirus scanning programs. Experienced computer programmers and hackers may be able to penetrate our network security and misappropriate or compromise our confidential information or that of our customers or other third-parties, create system disruptions, or cause shutdowns. Additionally, sophisticated software and applications that we produce or procure from third-parties may contain defects in design or manufacture, including "bugs" and other problems that could unexpectedly interfere with the operation of the information infrastructure. A disruption, infiltration or failure of our information infrastructure systems or any of our third-party data centers as a result of software or hardware malfunctions, computer viruses, cyber attacks, employee theft or misuse, power disruptions, natural disasters or accidents could cause breaches of data security, loss of critical data and performance delays, which in turn could adversely affect our business. To remain competitive, we must continue to enhance and improve the functionality and features of our websites. As a result, we will need to continue to improve and expand our third-party hosting relationships and related software capabilities. These improvements may require greater levels of spending than we have experienced in the past. Without such improvements, our operations might suffer from unanticipated system disruptions, slow application performance or unreliable service levels, any of which could negatively affect our reputation and ability to attract and retain customers and contributors. Furthermore, in order to continue to attract and retain new customers, we are likely to incur expenses in connection with continuously updating and improving our user interface and experience. We may face significant delays in introducing new services, products and enhancements. If competitors introduce new products and services using new technologies or if new industry standards and practices emerge, our existing websites and our proprietary technology and systems may become obsolete or less competitive, and our business may be harmed. In addition, the expansion and improvement of our systems may require us to commit substantial financial, operational and technical resources, with no assurance that our business will improve. The Units of SAFE (Simple Agreement for Future Equity) will not be freely tradable until at least one year from the initial purchase date. Although the Units of SAFE (Simple Agreement for Future Equity) may be tradable under federal securities law, state securities regulations may apply and each Purchaser should consult with his or her attorney. You should be aware of the long-term nature of this investment. There is not now and likely will not be a public market for the Securities. Because the Securities have not been registered under the Securities Act or under the securities laws of any state or non-United States jurisdiction, the Securities have transfer restrictions and cannot be resold in the United States except pursuant to Rule 501 of Regulation CF and the terms and conditions of the security instrument. It is not currently contemplated that registration under the Securities Act or other securities laws will be effected. Limitations on the transfer of Securities may also adversely affect the price that you might be able to obtain for the Securities in a private sale. Purchasers should be aware of the long-term nature of their investment in the Company. Each Purchaser in this Offering will be required to represent that it is purchasing the Securities for its own account, for investment purposes and not with a view to resale or distribution thereof. No governmental agency has reviewed or passed upon this Offering, the Company or any Securities of the Company. The Company also has relied on exemptions from securities registration requirements under applicable state securities laws. Purchasers in the Company, therefore, will not receive any of the benefits that such registration would otherwise provide. Prospective Purchasers must therefore assess the adequacy of disclosure and the fairness of the terms of this Offering on their own or in conjunction with their personal advisors. There is no assurance that a Purchaser will realize a return on its investment or that it will not lose his or her entire investment. For this reason, each Purchaser should read the Form C and all Exhibits carefully and should consult with his or her own attorney and business advisor prior to making any investment decision. The Companys right to repurchase the Securities at a minimum premium should not be construed as a guarantee of a return on investment as the right is solely held by the Company and cannot be forced by the investor. The Securities do not accrue interest or otherwise compensate Purchasers for the period in which the Company uses proceeds from the Offering. The Securities will accrue no interest and have no maturity date. Therefore, Purchasers generally will not be compensated for the time in which the Company uses the proceeds from the Offering before a possible equity financing or Liquidity Event that could result in the conversion of the Security, to the benefit of the Purchaser. The right of repurchase held by the Company does not provide for interest to be paid on the Security, this means that factors like inflation and the relative value of the dollar may mean the minimum premium return may not even provide a return of principal. Prior to the Offering the Companys current owners of 20% or more beneficially own up to 75.0% of the Company. Subject to any fiduciary duties owed to our other owners or Purchasers under Delaware law, these owners may be able to exercise significant influence over matters requiring owner approval, including the election of directors or managers and approval of significant Company transactions, and will have significant control over the Companys management and policies. Some of these persons may have interests that are different from yours. For example, these owners may support proposals and actions with which you may disagree. The concentration of ownership could delay or prevent a change in control of the Company or otherwise discourage a potential acquirer from attempting to obtain control of the Company, which in turn could reduce the price potential investors are willing to pay for the Company. In addition, these owners could use their voting influence to maintain the Companys existing management or support or reject other management and board proposals that are subject to owner approval. We have arbitrarily set the price of the Securities with reference to similar offerings by third-parties that have been conducted pursuant to Regulation CF. The Offering price for the Securities should not be considered an indication of the actual value of the Securities and is not based on our net worth or prior earnings. We cannot assure you that the Securities could be resold by you at the Offering price or at any other price. Purchasers will not become equity holders unless and until the Company decides to convert the Securities into CF Shadow Preferred Stock or until an IPO or sale of the Company provided the Company has not first invoked its right to repurchase the Securities. Purchasers will not have an ownership claim to the Company or to any of its assets or revenues for an indefinite amount of time, and depending on when and how the Securities are converted, the Purchasers may never become equity holders of the Company. Purchasers will not become equity holders of the Company unless the Company receives a future round of financing great enough to trigger a conversion and the Company elects to convert the Securities or as otherwise provided in the security instrument. The Company is under no obligation to convert the Securities into the type of equity Securities Purchasers are entitled to receive upon such conversion (CF Shadow Preferred Stock). In certain instances, such as a sale of the Company, an IPO or a dissolution or bankruptcy, the Purchasers may only have a right to receive cash, to the extent available, rather than equity in the Company. The Company retains a right to repurchase the securities for the greater of their fair market value or a minimum return amount; this right can be exercised at any time, so long as the Company achieves gross revenues in excess of $1,000,000 per annum and has not planned and does not anticipate a Liquidity Event in the next 12 calendar months; this means, even if the Company eventually has an IPO or is sold, Purchasers may be prevented from becoming equity holders or seeing the full return as if they had become equity holders at the time of such IPO or sale of the Company. Purchasers will not have voting rights, even upon conversion of the Securities into CF Shadow Preferred Stock. Purchasers will not have the right to vote upon matters of the Company even if and when their Securities are converted into CF Shadow Preferred Stock except to the extent required by applicable law. Upon such conversion, CF Shadow Preferred Stock will have no voting rights and even in circumstances where a statutory right to vote is provided by applicable law, the CF Shadow Preferred Stock holders are required to vote with the majority of the security holders in the new round of equity financing upon which the Securities were converted. For example, if the Securities are converted upon a round offering Series B Preferred Shares, the Series B-CF Shadow Preferred Stock holders will be required to vote the same way as a majority of the Series B Preferred Shareholders vote. Thus, Purchasers will never be able to freely vote upon any director or other matters of the Company. Purchasers will not be entitled to any inspection or information rights other than those required by Regulation CF or other applicable law. Purchasers will not have the right to inspect the books and records of the Company or to receive financial or other information from the Company, other than as required by Regulation CF or other applicable law. Other security holders of the Company may have such rights. Regulation CF requires only the provision of an annual report on Form C and no additional information. This lack of information could put Purchasers at a disadvantage in general and with respect to other security holders. In a dissolution or bankruptcy of the Company, Purchasers of Securities which have not been converted will be entitled to distributions as if they were common stock holders. This means that such Purchasers will be at the lowest level of priority and will only receive distributions once all creditors as well as holders of more senior securities, including any preferred stock holders, have been paid in full. If the Securities have been converted into CF Shadow Preferred Stock, the Purchasers will have the same rights and preferences (other than the ability to vote) as the holders of the securities issued in the equity financing upon which the Securities were converted. Unlike convertible notes and some other securities, the Securities do not have any "default" provisions upon which the Purchasers will be able to demand repayment of their investment. The Company has ultimate discretion as to whether or not to convert the Securities upon a future equity financing and Purchasers have no right to demand such conversion. Only in limited circumstances, such as a Liquidity Event, may the Purchasers demand payment and even then, such payments will be limited to the amount of cash available to the Company. However, the Company may demand a repurchase of the Securities. The Company may never elect to convert the Securities, undergo a Liquidity Event or repurchase the Securities. The Company may never receive a future equity financing or elect to convert the Securities upon such future financing. In addition, the Company may never undergo a Liquidity Event such as a sale of the Company or an IPO. If neither the conversion of the Securities nor a Liquidity Event occurs, the Purchasers could be left holding the Securities in perpetuity. The Securities have numerous transfer restrictions and will likely be highly illiquid, with no secondary market on which to sell them. The Securities are not equity interests, have no ownership rights, have no rights to the Companys assets or profits and have no voting rights or ability to direct the Company or its actions. While the Company reserves the right to repurchase the securities at the greater of a predetermined premium or the fair market value, the Company may never elect to do so. See The Company may demand that the Purchaser sells his or her Securities to the Company. The Company may demand that the Purchaser sells his or her Securities to the Company. The Company may demand that the Purchaser sells the Purchasers Securities back to the Company, subject to certain terms and conditions. If the Company achieves gross revenues in excess of $1,000,000 per annum and the Company has not planned and does not anticipate a Liquidity Event in the next 12 calendar months, the Company, at its sole discretion, may announce and implement a repurchase of the Securities, the price paid being the greater of (A) the purchase amount plus a fifty-percent (50%) premium or (B) the fair market value of such Security, as determined by an independent third party. While the Company must certify that no Liquidity Event happens within the 12 months preceding the repurchase or make the Purchaser whole if a Liquidity Event does occur, and such liquidity event would have left the Purchaser in a better financial, the investor may still lose the full benefit of their potential investment due to the repurchase. The Securities do not have a discount rate. The Securities do not have a discount rate, which would be applied to the conversion price of the Securities based on the price of a future equity financing. Convertible securities often provide a discount rate, which is applied to the price of the future financing to determine the conversion price. For instance, if the future equity financing were priced at $10 per share, convertible securities that incorporated a discount rate might be convertible at $8 per share. Such discount rate benefits the convertible security holders, who receive more securities from the conversion than the purchase price of their convertible securities would suggest. The Securities do not have a discount rate and thus, unless the Valuation Cap (as described below) affects the conversion, will be convertible at the price established by the future equity financing regardless of the price of such future securities or the future valuation of the Company. Estate planning is a boring, overlooked industry that is controlled by traditional lawyers. Industry is ripe for disruption and Trust & Wills appears to have the product and team in place in order to pull it off. Let's go team, looking forward to it! Targeting a market that doesn't want to do things the old fashioned way and will need services like these as they get older (Gen X, Millennials). Clear focus on user experience and design - site is easy to use. 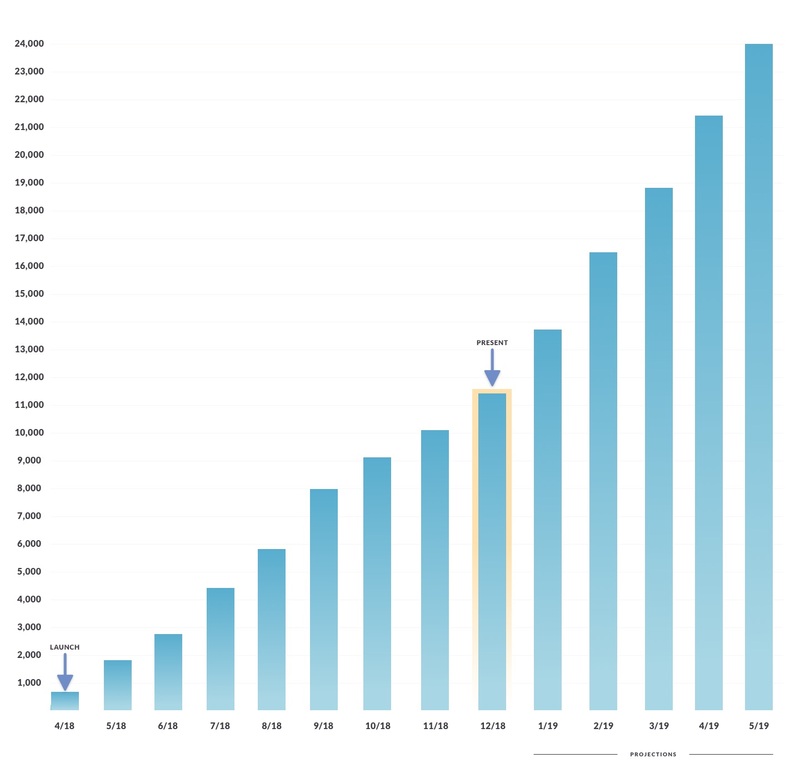 Scalable. I’ve been looking for something like this ever since we had our first kids. It’s sure to be a hit idea and the team clearly has traction so hoping they can be the ones to take it mainstream. I invested because this is a problem I have been wrestling with in my own life as my family grows and I need to make provisions should something unexpected happen. Impressed by simplicity and professionalism. The process and fees associated with wills and trusts are extreme and have caused my family to ignore the importance of both. Anything that will help make the process easier and cheaper, I’m all for it. Honestly sounds like a great deal, I could pay $399 for a trust, or invest $500 get it and be invested in what definitely sounds like a great opportunity. After dealing with our will and setting up trusts this has to be easier. Because they fill a need that I have personally and they are attacking the excuses I have always used. I also intend to try them. i invested because when my mom passed away I had to go into probate and if i had a better understanding of trusts and wills it would have saved me thousands of dollars. Everyone should be able to preserve their estates easily. I recently went through the will process, I liked the idea of streamlining this for an increasingly technological generation. Like the business model and service being provided to clients. Putting together a Will is not exactly something people are eager to do so anything that simplifies the process makes people more likely to do it and keep it up to date. The Trust & Will platform seems to me to be a first step in that direction.